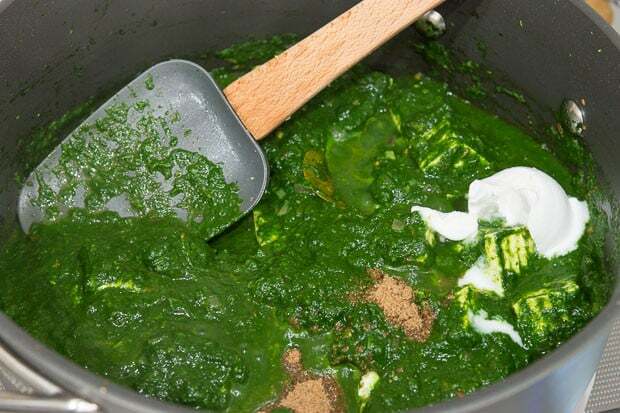 Palak Paneer is an Indian spinach and cheese curry. For my version, I marinate tofu to make a vegan paneer before adding it to the rich spinach curry. Considering its relative simplicity and abundant array of vegetarian dishes, Indian food never fails to amaze me with its full-flavored culinary repertoire that never leaves me wanting meat. 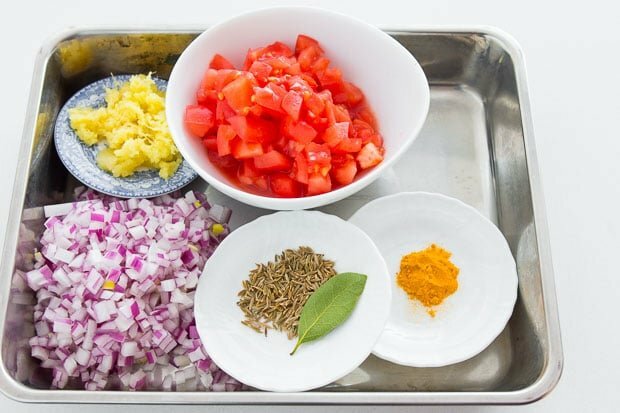 Some may argue that if you add enough spices you can make boot leather taste good, but Indian cuisine isn’t about wanton seasoning. At its core, the cuisine is subtly nuanced with dishes that are brimming with umami, while maintaining a palate pleasing balance of the other four basic tastes. Palak Paneer (a.k.a. 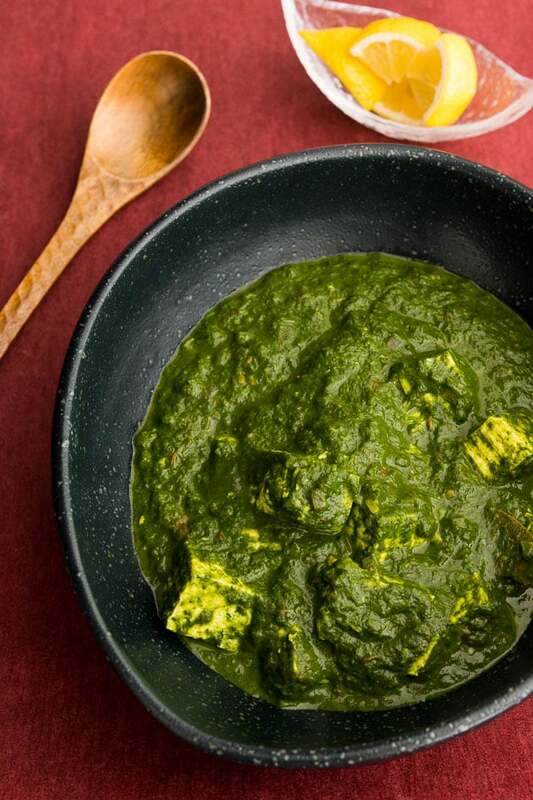 Saag Paneer) is no exception and although the curry is largely comprised of pureed spinach and a bland cheese, it manages to eke out a monstrous amount of flavor from the rest of the ingredients. While the original isn’t fully plant-based due to the cheese and addition of cream at the end, it’s fairly easy to take this dish the last step from vegetarian to vegan by making a few minor changes. Paneer is a mild fresh cheese that’s made by curdling milk with an acid and then pressing the curds. 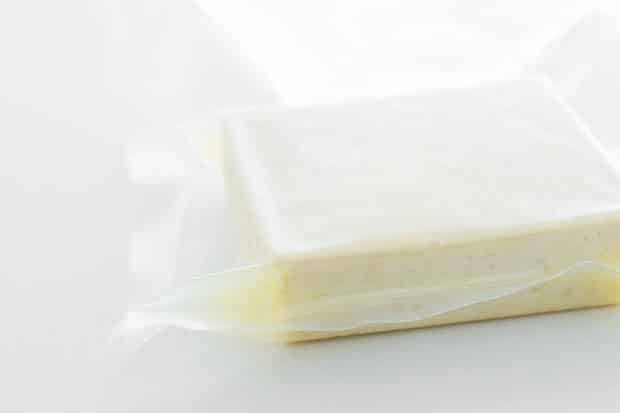 When it’s freshly made and minimally processed, the cheese has a tender melt-in-your-mouth texture not unlike tofu. While the texture may be close, the taste and flavor is a world away. Paneer is rich, creamy and savory with just a hint of tartness while tofu tends to be watery, vegetal, bland and flat. By marinating the tofu for a few days in nutritional yeast, lemon juice and salt it’s possible to bridge this gap and create a plant-based palak paneer that’s just as flavorful as the original. The marinade helps the tofu shed its soy flavor flavor in favor of something distinctly dairy and dare I say, close to the Indian cheese. The second benefit is that the salt coaxes out water giving the tofu a firmer texture that better resembles the freshly pressed curds of paneer. 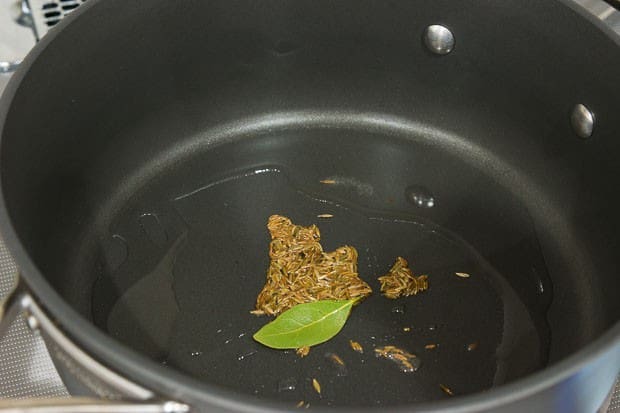 While it’s important to cook the curry long enough for the flavors to mingle and to take the green edge off the spinach, the application of gratuitous heat will turn the spinach an unappetizing shade of koala poop green and give it a canned spinach smell that’s equally disagreeable. That’s why I like to start with fresh spinach, blanching it only long enough to wilt it before throwing it in a blender to puree. After toasting the spices and caramelizing some aromatics, the spinach and paneer go into the pot to get to know each other just long enough to break the ice. Finally, the pairing is consummated with a little extra spice and coconut milk to round off the edges and bring everything together. 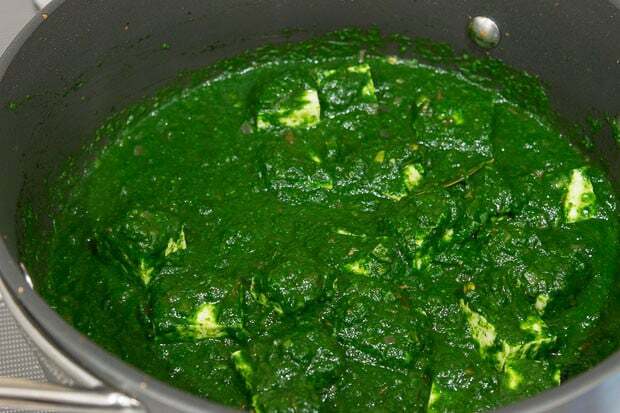 The resulting palak paneer is unexpectedly rich and intensely flavorful. The perfect curry for a round of naan or mound of pulao. Combine the nutritional yeast, lemon juice and salt in a freezer bag and then add the block of tofu. Press out as much air as possible and seal the bag. Let this marinate for at least 24 hours or up to 3 days in the refrigerator. 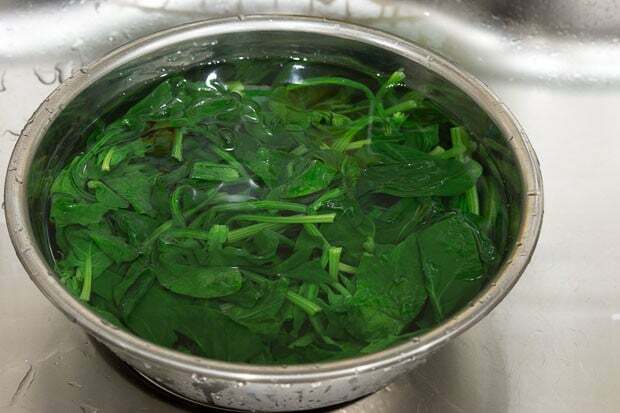 Boil a large pot of water and blanch the spinach just long enough for the spinach to wilt. Alternatively you can put the washed spinach(with a little water still on the leaves) in a microwave-safe bowl, cover with plastic wrap and and microwave until the leaves wilt. Immediately plunge the blanched spinach in cold water to stop the cooking. Drain the spinach but do not squeeze it. Put it in a blender or food processor to puree adding a little water if necessary. 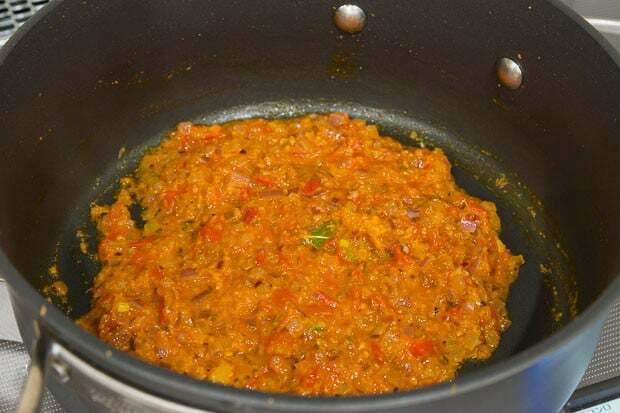 In a large saucepan, heat the coconut oil over medium-high heat until shimmering and then add the cumin seeds and bay leaf. 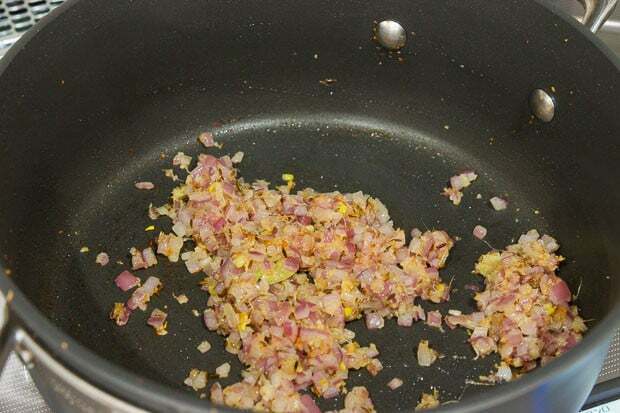 When the cumin starts popping, add the garlic and ginger and onions, sauteing until lightly browned and fragrant. Add the tomato, turmeric and salt and then saute until most of the liquid has evaporated from the tomatoes and the mixture is thick and chunky. Add the spinach puree and tofu and simmer over medium-low heat until mixture is creamy and fragrant (about 15 minutes). If the spinach is not thin enough to make a sauce, add some water. 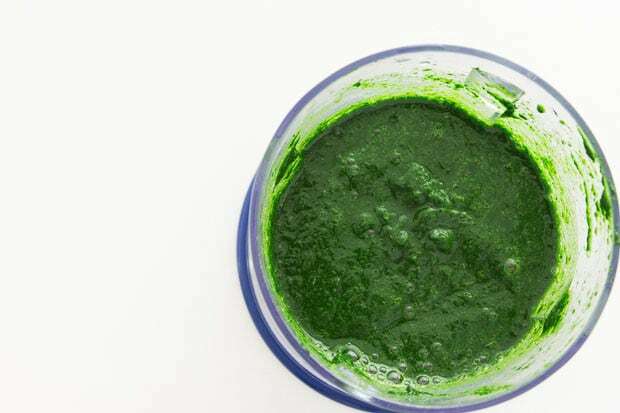 Adjust salt to taste and finish the palak paneer by adding the garam masala, cayenne pepper and coconut milk. Coconut cream is the thick white stuff that floats to the top of a can of coconut milk when it's left undisturbed. You can either scoop it off from a can of coconut milk or just buy a can/carton of coconut cream. I will try to make this. I haven’t found a recipe yet that compares to the restaurant in terms of taste. Looking forward to this one especially since it has tofu in it. Hi KD, I already have a butter chicken recipe here: http://norecipes.com/recipe/butter-chicken-recipe/ Are you looking for a vegan version? If so, I use a similar process with tofu to this recipe where it’s marinated first before grilling and adding to the curry. As for Pancit, it’s been on my list to make for ages. You think it doesn’t really work with pre-frozen spinach? I prefer fresh spinach to, but you don’t always get it in Germany. Hi Herr Yamamoto, frozen spinach should be fine and you can skip the blanching step. I’m not sure how best to measure it though since it probably won’t be a 1:1 swap with fresh spinach. Sry for asking so many qustion,ut i forogot to buy coconutoil, can i replace ist by smoething? Wonderful rendition! Palak Paneer is my favorite food. I am very excited to try this version too. Have you ever used fenugreek leaves in your Saag? I used to all the time but I haven’t been able to find any that weren’t bitter lately. It takes the dish to the next level! I learned it that way from an Indian chef in Virginia. He had trained in India and Europe. Hi Channon, good call, I do use fenugreek quite a bit, but adding too much will make the dish bitter. I’ve left it out here mainly to make this simpler (less ingredients), but adding some fenugreek leaves (Kasoori Methi) at the end is a great way to give the flavor a boost. Can I make this with Paneer rather than tofu and keep all the same ingredients, or do I need to add/omit any? Thank you for your time!! Hi Sll, yep you can certainly use the same recipe for Paneer, however if you aren’t vegan, you may also want to replace cream for the coconut cream as well. I just made this for dinner tonight – delicious!! There’s no paneer sold near me, but Latin American queso de freir is a tasty substitute (even if the texture is different). Thank you for sharing this! Going in my recipe book! Do you leave the tofu sitting out for three days? Or do you put it inside fridge? Mastering legal studies, you definitely want to do the marination in the fridge.